Although surgical techniques have significantly evolved in the last 20 years, most of the practicing surgeons have learned emerging surgical technologies on patients without going through any formal training. The current hierarchy of surgical training and education, worldwide, is primarily based on the Halsted model with very little regional modifications. Furthermore, a great majority of the surgical residents even in the USA and UK do not feel comfortable in performing even a highly standardized and moderately simple procedure such as colectomy and the level of difficulty escalates for procedures done by minimally invasive approaches. This paradigm leads to inequalities in the delivery of a standard modern surgical care, significant complications, and poses financial burden to the communities. The existing laparoscopic surgical training and assessment modalities include, but not limited to, laparoscopic surgery courses, surgical fellowships, on-site mentoring programs, and accredited surgical residency programs conducted at the designated training institutions. A modest exposure to the OR setup with state-of-the-art equipment and the acquisition of laparoscopic surgical skills provide a step forward for the surgical trainees wishing to master laparoscopic surgery. In addition, current surgical trainees routinely attain sufficient experience of basic laparoscopic procedures such as laparoscopic cholecystectomy and appendectomy. In the wake of the described advantages, surgical trainees are perceived to be sufficiently trained in their pertinent subspecialties of laparoscopic surgery. “Unfortunately, a recent Dukes' Club survey of colorectal trainees has stated that 85% felt that they would not be adequately trained or confident to independently perform a laparoscopic colorectal resection by the end of their higher surgical training.” These disappointing figures urge the surgical educators and trainees to explore gaps in laparoscopic surgery training and to recommend a unified training strategy that can produce safe and competent laparoscopic surgeons. A range of innovative surgical training tools are commercially available that can facilitate learners in acquiring their desired surgical armamentarium. Throughout the training period, there is a pressing need to ensure active participation of learners such as by placing information in a clinically meaningful context or by creating situations that facilitate deliberate practice. The overarching goal is to make learning an active process rather than a passive engagement by learners. There is paucity of knowledge about the emerging and innovative tools for surgical training and education. At the same time, very few of the world-renowned laparoscopic surgery training and education centers apply a standardized surgical training curriculum for accreditation and validation of training programs. Every center has its own training agenda and protocol that is primarily driven by the available resources, surgical training tools, and expertise and legislative guidelines. 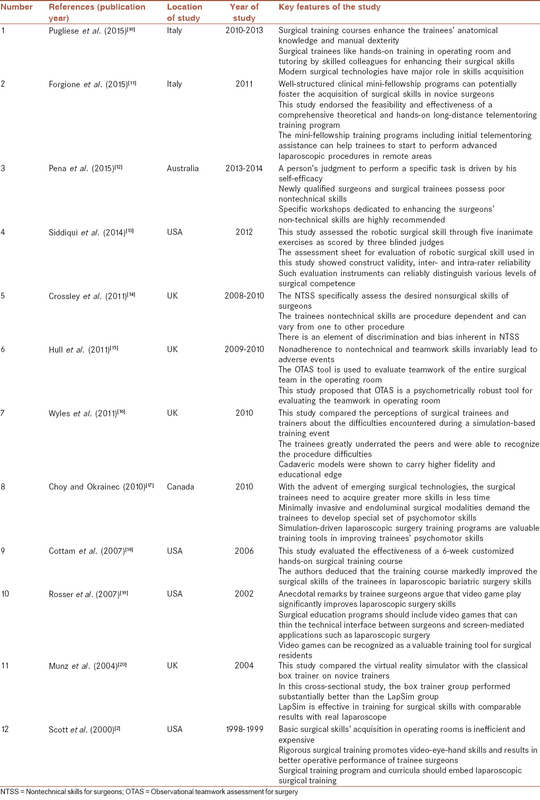 This systematic review provides a deep insight into the merits and demerits of some modern surgical training tools and elaborates some of the existing laparoscopic surgery training programs worldwide. During November 2015, the databases of Educational Resources Information Center, the Web of Science, EBSCO and MEDLINE, and the Cochrane Library were searched using MeSH terms “Laparoscopic surgery” and “Surgical training” and “Surgical curriculum” and “fundamentals of endoscopic surgery (FES)” and “fundamentals of laparoscopic surgery (FLS)” and “Telementoring” and “Box trainer” for the full-text English language review and original articles published during 1995–2015. 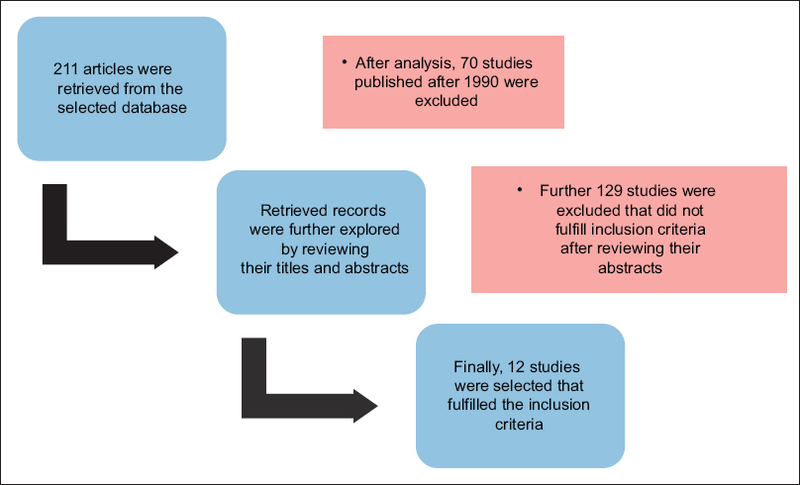 The preferred reporting items for systematic reviews and meta-analyses (PRISMA) was used for this research., Data extraction was done using the eligibility criteria of selecting the original and review articles and by excluding the editorial articles, short communications, conference proceedings, personal view, and commentaries. The initial search yielded 211 results. Data synthesis and data analysis were undertaken by scrutinizing the initially retrieved articles. In cases of duplicate studies, only the latest article was included. Irrelevant articles and abstracts were excluded from this search. Differences between data results were resolved by discussions between two independent researchers and by reaching general consensus. Finally, 12 articles were selected for this systematic review. A schematic step-wise algorithm of short listing the final list of 12 articles is shown in [Figure 1]. The key characteristics of each article are shown in [Table 1]. This systematic review lays down a blend of surgical educational tools in the first part and later, elaborates the effectiveness of accredited centers that can be used to measure surgical competence. In addition, several accredited surgical training and educational venues, available worldwide, are briefly described. Numerous models for surgical education are available that can complement the accredited surgical residency programs worldwide. Some models for surgical education using modern cutting-edge technologies are elaborated hereunder. Several studies have reported that approximately 10% of the admitted patients develop some kind of unwanted surgical complications due to human error.,, Traditionally, surgical education has been based on the popular “see one, do one, teach one” approach. This approach inadvertently exposes patients to inexperienced trainees that endangers their health and safety. Climbing the steep learning curve by surgical trainees can no longer be accomplished by trial and error, necessitating the need to explore, define, and implement surgical educational models that do not jeopardize patient safety. One such model implies simulation that refers to “a technique to replace or amplify real-patient experiences with guided experiences, artificially contrived, that evokes or replicates substantial aspects of real world in a fully interactive manner.” Simulation has the potential to enhance experiential learning and patient safety, recreate scenarios that are rarely encountered, and can assess the trainees' skills and competence in diverse situations. Two popular simulation-based models for surgical training are described. The mechanical simulators are boxes where objects or organs are placed and accessed using surgical instruments. The trainers incorporate the conventional laparoscopic instruments and are primarily used by novice surgeons who start to learn laparoscopic skills. Synthetic materials as well as animal organs or tissues are used in this simulation model. The quality of the tactile feedback is perceived to be the same as in the operating room (OR), and the surgical performance can be monitored by trained surgeons. A study by Bonrath et al. compared the baseline laparoscopic skills of 24 novices by randomizing them in three groups: LapSim virtual reality simulator (VRS), mechanical box trainer, and no training (control). After 3 weeks of training, all trainees were assessed for motion analysis and error scores. Both trained groups showed significantly improved scores in all domains under consideration. Unfortunately, to date, the conclusive value of VRS in terms of its cost-effectiveness has not been determined. Animal models play significant role in surgical training, education, and research and facilitate the initial applications of innovative technique. Live animal surgery remains the best training models, offering a high level of fidelity unmatched by other kinds of simulation models. Globally, the use of animal labs is accepted if there is no reliable substitute for training and education, however, stringent implementation of legislative protocol of Rs. 3: “Refine the procedure to limit suffering, Reduce the number of animals to a minimum, Replace the use of animals with nonanimal alternatives when appropriate” should be observed. Simulations in animal labs are the only portals in surgical training that allow training on live tissues and learners can work in real OR-simulated situations. Training of surgical skills on a cadaver offers the greatest anatomy realism for a surgical trainee before embarking on living human beings. A study compared the human cadaver model with an augmented reality simulator for laparoscopic colorectal skills acquisition and argued that, although difficult, the human cadaver model was better appreciated than simulators for laparoscopic sigmoid colectomy. The investigators proposed that simulator-based training followed by cadaver training can be conveniently integrated into surgical learning curve. Further technological refinements have introduced new cadavers with embalmed features and beating cadavers that can provide fundamental substrate for surgical education. Studies have shown that focused mini-fellowship with hands-on operative and clinical sessions enables practicing surgeons to acquire the desired surgical competence that can allow to successfully implement a laparoscopic surgical practice., Similarly, a mini-fellowship surgical training program was successfully employed at the Advanced International Mini-invasive Surgery (AIMS) Academy that included telementoring sessions in the remote area of Russia. The overarching lesson from this program signifies that, for being a competent surgeon, the acquisition of technical skills is as important as the attainment of clinical knowledge. It is noteworthy that similar protocol can be employed for training the personnel from other surgical disciplines as well. Jenkins et al. studied a proficiency-based structured task-specific training program for the laparoscopic colorectal surgery. The study applied training in a sequential manner by fragmenting complex laparoscopic colorectal procedures for each trainee and concluded that multi-modality training with modular operative strategy shortened the time to proficiency gain with low morbidity and an error rate of 25%. Preceptoring is practiced when an experienced surgeon scrubs with the learner to guide the surgical procedure or is ready to intervene. On the other hand, a proctor is a supervisor who monitors surgery, gives advice, and intervenes when necessary. Preceptoring is often required before the trainee has acquired the desired surgical skills for a given procedure. Because of the escalating ethical and medicolegal issues, preceptoring allows training on patients while maintaining the standards set for patients safety. Nevertheless, there is a need to implement guidelines and proctoring recommendations that can protect surgeons, proctors, institutions, and above all, the patients. Medicolegal risks and patient safety should be considered while practicing such educational strategies. Telementoring entails “the process of remote guidance and technical assistance to surgical procedures, utilizing telecommunication techniques.” Telemedicine sweeps away distance barriers and can provide sufficient expertise to novices in remote rural areas. This innovative technology provides a high-definition profile of operative field, allows verbal communication between the mentor and mentee, and allows the trainer to point on the screen for further operative steps. Since the mentoring process is not restricted by distance, the costs of formal mentoring programs may be reduced and remote assistance can be incorporated into formal training schedule. Using Zeus TS microjoint system (Computer Motion Inc., Santa Barbara, CA, USA), an expert robotic surgeon can provide telepresence for trainee surgeons in rural and remote areas across the world. The telerobotic expert can guide intraoperatively at a remote site, looking at the same images as the primary surgeons, as both are located outside the surgical field. The primary goal of this modern strategy for surgical training is to enable local surgeons to perform a range of robotic surgical cases to gain sufficient expertise with the assistance of an expert surgeon. However, as a prerequisite, the trainee surgeon should be first trained in basic and advanced laparoscopic procedures by short courses and training for mentoring and telementoring applications. Anvari et al. established the world first remote telerobotic surgical service by providing advanced laparoscopic surgical services in rural community. As many as 21 telerobotic laparoscopic operations were performed without any intraoperative complication. The investigators have argued that refinements in the robotic and telecommunication technology would provide a platform for routine use of the state-of-the-art laparoscopic surgical services in rural communities. The salient features of all the aforementioned surgical educational modalities along with their merits and demerits are outlined in [Table 2]. FLS, a joint venture by Society of American Gastrointestinal and Endoscopic Surgeons (SAGES) and the American College of Surgeons, has been developed to teach and assess the knowledge, judgment, and skills inherently required for laparoscopic surgery. The program of FLS meets the required standards of inter-rater and test–retest reliability as well as internal consistency that are fundamental to a valid assessment strategy. A physical endotrainer box simulator is used for assessment. During assessment, each designated action is ranked using measures of efficiency (time) and precision, with negative marking for errors. A trained proctor supervises this process and awards marks to each task. FLS offers a cheap as well as complete learning protocol for teaching laparoscopic surgery with an added advantage of a validated assessment strategy. Flexible endoscopy is a key domain of surgical services. Surgeons perform upper and lower gastrointestinal endoscopy as part of preoperative work-up, for intraoperative evaluation and postoperatively to identify the anatomic changes induced by surgical intervention. FES is a comprehensive educational tool that includes (a) web-based didactic component of flexible endoscopy, (b) written multiple choice exam (cognitive component), and (c) a 5-module virtual reality skills examination (hands-on component). Fundamental skills for robotic surgery has been validated as an effective, feasible, and structured curriculum that demonstrates its effectiveness by significant improvements in basic robotic surgery skills. This incorporates a simulation-based robotic curriculum that can be conveniently embedded in surgical training and educational programs. A growing body of literature has shown that surgeons' intraoperative nontechnical skills are strongly correlated with surgical outcomes.,, Breakdowns in surgeon's behavior in the OR negatively affect nontechnical characteristics such as teamwork, leadership, communication, confidence, and decision-making. Lack of such cognitive and interpersonal skills inadvertently leads to surgical errors and high compensation payouts., Education and assessment of nontechnical skills in surgery leads to enhanced surgeons' performance in the OR that will improve quality as well as patient safety., Surgical educators are gradually involving virtual and E-learning tools in surgical training and the distance learning arm of these modalities makes E-learning more attractive and feasible. It is imperative to deeply understand the preferred resources of surgical education as desired by the surgical trainees. Guraya et al. explored the preferred learning resources of the participants attending surgical courses at the AIMS Academy during 2010–2013 and found that a great majority of respondents (467/636; 73%) preferred “direct experience in the OR” as their favorite educational resource, followed by “tutoring by skilled trainer” by 426/636 respondents. The study had concluded that surgical trainees preferred hands-on training and mini-fellowship courses for enhancement of their surgical skills. In view of these findings, surgical educators can utilize a myriad of training tools for the purpose of imparting knowledge and skills to surgical trainees. Depending on the available resources and expertise, varying combinations and extent of the described surgical tools can be embedded into the training programs of a given surgical specialty. In the later section of this article, some popular models for surgical training are described. 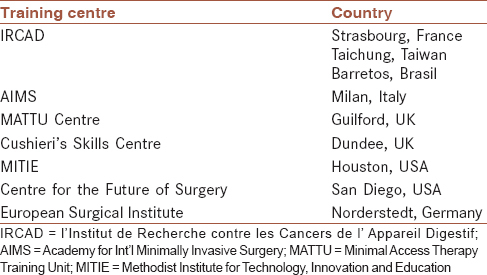 Numerous centers dedicated to surgical education and training are available worldwide. The most popular training centers across the world are outlined in [Table 3]. The l'Institut de Recherche contre les Cancers de l'Appareil Digestif (IRCAD) offers the opportunity to train with animals, while the UK centers use cadavers, as animal surgical training is forbidden. The AIMS Academy is a state-of-the-art training venue for hands-on surgical training along with the opportunity for in-campus and telementoring laparoscopic surgery courses and fellowship programs. The major online resources for surgical education and training are provided by WebSurg, SAGES Online, European Association for Endoscopic Surgeons, and American Society for Gastrointestinal Endoscopy. WebSurg is an international E-learning website offering first-rate educational content in all fields of minimally invasive surgery provided by world-renowned experts. This E-learning platform hosts a repository of virtual library containing high-quality videos from expert laparoscopic surgeons across the world. Using a blend of educational tools, structured training programs can provide accredited surgical training to residents. In view of the escalating concerns about patient safety and quality control in surgery, there is an ever-increasing need for modifications and interventions in surgical training. These objectives can be successfully achieved by complementing traditional training with teaching, training, and assessment of laparoscopic skills outside the OR. The surgical residents would get their validated and accredited training for certifications while established surgeons will be able to update and refresh their surgical knowledge and skills. A myriad of surgical training tools can help complement the surgical training and education. Owing to ethical and medicolegal issues, the usage of both animal and cadaver models can be gradually replaced by virtual simulators. Virtual surgical simulators represent the futuristic educational bridge between ex vivo and in vivo surgical training. Several state-of-the-art surgical institutions such as IRCAD, AIMS Academy, and Minimal Access Therapy Training Unit offer promising resources for surgical training and accrediting the trainees' performance. However, these centers are employing different tools and modalities each with some advantages and some disadvantages. Hence, at the moment, we cannot recommend a single superior model for surgical training and assessment. Scott DJ, Bergen PC, Rege RV, Laycock R, Tesfay ST, Valentine RJ, et al. Laparoscopic training on bench models: Better and more cost effective than operating room experience? J Am Coll Surg 2000;191:272-83. Grover BT, Kothari SN, Kallies KJ, Mathiason MA. Benefits of laparoscopic fellowship training: A survey of former fellows. Surg Innov 2009;16:283-8. Moug SJ, McCarthy K, Nesbitt C. Bridging the gap: How higher surgical training programmes can produce consultant laparoscopic colorectal surgeons. Colorectal Dis 2013;15:911-3. Bowles CJ, Leicester R, Romaya C, Swarbrick E, Williams CB, Epstein O. A prospective study of colonoscopy practice in the UK today: Are we adequately prepared for national colorectal cancer screening tomorrow? Gut 2004;53:277-83. Vassiliou MC, Ghitulescu GA, Feldman LS, Stanbridge D, Leffondré K, Sigman HH, et al. The MISTELS program to measure technical skill in laparoscopic surgery: Evidence for reliability. Surg Endosc 2006;20:744-7. Ericsson KA. An expert-performance perspective of research on medical expertise: The study of clinical performance. Med Educ 2007;41:1124-30. Guraya SY. Association of type 2 diabetes mellitus and the risk of colorectal cancer: A meta-analysis and systematic review. World J Gastroenterol 2015;21:6026-31. Guraya SY, Forgione A, Sampogna G, Pugliese R. The mapping of preferred resources for surgical education: Perceptions of surgical trainees at the Advanced International Minimally Invasive Surgery Academy (AIMS), Milan, Italy. Journal of Taibah University Medical Sciences 2015;10(4):396-404. Pena G, Altree M, Field J, Thomas MJ, Hewett P, Babidge W, et al. Surgeons' and trainees' perceived self-efficacy in operating theatre non-technical skills. Br J Surg 2015;102:708-15. Siddiqui NY, Galloway ML, Geller EJ, Green IC, Hur HC, Langston K, et al. Validity and reliability of the robotic Objective Structured Assessment of Technical Skills. Obstet Gynecol 2014;123:1193-9. Crossley J, Marriott J, Purdie H, Beard JD. Prospective observational study to evaluate NOTSS (non-technical skills for surgeons) for assessing trainees' non-technical performance in the operating theatre. Br J Surg 2011;98:1010-20. Hull L, Arora S, Kassab E, Kneebone R, Sevdalis N. Observational teamwork assessment for surgery: Content validation and tool refinement. J Am Coll Surg 2011;212:234-43.e1-5. Wyles SM, Miskovic D, Ni Z, Acheson AG, Maxwell-Armstrong C, Longman R, et al. Analysis of laboratory-based laparoscopic colorectal surgery workshops within the English National Training Programme. Surg Endosc 2011;25:1559-66. Choy I, Okrainec A. Simulation in surgery: Perfecting the practice. Surg Clin North Am 2010;90:457-73. Cottam D, Holover S, Mattar SG, Sharma SK, Medlin W, Ramanathan R, et al. The mini-fellowship concept: A six-week focused training program for minimally invasive bariatric surgery. Surg Endosc 2007;21:2237-9. Rosser JC Jr., Lynch PJ, Cuddihy L, Gentile DA, Klonsky J, Merrell R. The impact of video games on training surgeons in the 21st century. Arch Surg 2007;142:181-6. Munz Y, Kumar BD, Moorthy K, Bann S, Darzi A. Laparoscopic virtual reality and box trainers: Is one superior to the other? Surg Endosc 2004;18:485-94. Baker GR, Norton PG, Flintoft V, Blais R, Brown A, Cox J, et al. The Canadian Adverse Events Study: The incidence of adverse events among hospital patients in Canada. CMAJ 2004;170:1678-86. Bonrath EM, Gordon LE, Grantcharov TP. Characterising 'near miss' events in complex laparoscopic surgery through video analysis. BMJ Qual Saf 2015;24:516-21. Pucher PH, Aggarwal R, Almond MH, Darzi A. Surgical care checklists to optimize patient care following postoperative complications. Am J Surg 2015;210:517-25. Gorrindo T, Beresin EV. Is “see one, do one, teach one” dead? Implications for the professionalization of medical educators in the twenty- first century. Acad Psychiatry 2015;39:613-4. Jakimowicz J, Fingerhut A. Simulation in surgery. Br J Surg 2009;96:563-4. Rehrig ST, Powers K, Jones DB. Integrating simulation in surgery as a teaching tool and credentialing standard. J Gastrointest Surg 2008;12:222-33. Rassweiler J, Klein J, Teber D, Schulze M, Frede T. Mechanical simulators for training for laparoscopic surgery in urology. J Endourol 2007;21:252-62. Villegas L, Schneider BE, Callery MP, Jones DB. Laparoscopic skills training. Surg Endosc 2003;17:1879-88. Susmitha WK, Mathew G, Devasahayam SR, Perakath B, Velusamy SK. Factors influencing forces during laparoscopic pinching: Towards the design of virtual simulator. Int J Surg 2015;18:211-5. Gallagher AG, Satava RM. Virtual reality as a metric for the assessment of laparoscopic psychomotor skills. Learning curves and reliability measures. Surg Endosc 2002;16:1746-52. Taffinder N, Smith SG, Huber J, Russell RC, Darzi A. The effect of a second-generation 3D endoscope on the laparoscopic precision of novices and experienced surgeons. Surg Endosc 1999;13:1087-92. Giannotti D, Patrizi G, Di Rocco G, Vestri AR, Semproni CP, Fiengo L, et al. Play to become a surgeon: Impact of Nintendo Wii training on laparoscopic skills. PLoS One 2013;8:e57372. Green CS, Bavelier D. Action video game training for cognitive enhancement. Curr Opin Behav Sci 2015;4:103-8. Green CS, Bavelier D. Action video game modifies visual selective attention. Nature 2003;423:534-7. Hafford ML, Van Sickle KR, Willis RE, Wilson TD, Gugliuzza K, Brown KM, et al. Ensuring competency: Are fundamentals of laparoscopic surgery training and certification necessary for practicing surgeons and operating room personnel? Surg Endosc 2013;27:118-26. Kennedy AM, Boyle EM, Traynor O, Walsh T, Hill AD. Video gaming enhances psychomotor skills but not visuospatial and perceptual abilities in surgical trainees. J Surg Educ 2011;68:414-20. Schlickum MK, Hedman L, Enochsson L, Kjellin A, Felländer-Tsai L. Systematic video game training in surgical novices improves performance in virtual reality endoscopic surgical simulators: A prospective randomized study. World J Surg 2009;33:2360-7. Ou Y, McGlone ER, Camm CF, Khan OA. Does playing video games improve laparoscopic skills? Int J Surg 2013;11:365-9. Sun YH, Wu Z, Yang B. The Laparoscopic Animal Lab Training Module. In: The Training Courses of Urological Laparoscopy. Springer London: 2012. p. 45-59. Mutter D, Dallemagne B, Perretta S, Vix M, Leroy J, Pessaux P, et al. Innovations in minimally invasive surgery: Lessons learned from translational animal models. Langenbecks Arch Surg 2013;398:919-23. Jacobson S, Epstein SK, Albright S, Ochieng J, Griffiths J, Coppersmith V, et al. Creation of virtual patients from CT images of cadavers to enhance integration of clinical and basic science student learning in anatomy. Med Teach 2009;31:749-51. LeBlanc F, Champagne BJ, Augestad KM, Neary PC, Senagore AJ, Ellis CN, et al. A comparison of human cadaver and augmented reality simulator models for straight laparoscopic colorectal skills acquisition training. J Am Coll Surg 2010;211:250-5. Benkhadra M, Faust A, Ladoire S, Trost O, Trouilloud P, Girard C, et al. Comparison of fresh and Thiel's embalmed cadavers according to the suitability for ultrasound-guided regional anesthesia of the cervical region. Surg Radiol Anat 2009;31:531-5. Agrawal S. Post-CCT national surgical fellowship in bariatric and upper GI surgery. Bull R Coll Surg Engl 2010;92:354-7. Jenkins JT, Currie A, Sala S, Kennedy RH. A multi-modal approach to training in laparoscopic colorectal surgery accelerates proficiency gain. Surg Endosc 2016;30:3007-13. Zorn KC, Gautam G, Shalhav AL, Clayman RV, Ahlering TE, Albala DM, et al. Training, credentialing, proctoring and medicolegal risks of robotic urological surgery: Recommendations of the society of urologic robotic surgeons. J Urol 2009;182:1126-32. Rogers SO Jr., Gawande AA, Kwaan M, Puopolo AL, Yoon C, Brennan TA, et al. Analysis of surgical errors in closed malpractice claims at 4 liability insurers. Surgery 2006;140:25-33. Antoniou SA, Antoniou GA, Franzen J, Bollmann S, Koch OO, Pointner R, et al. A comprehensive review of telementoring applications in laparoscopic general surgery. Surg Endosc 2012;26:2111-6. Sebajang H, Trudeau P, Dougall A, Hegge S, McKinley C, Anvari M. The role of telementoring and telerobotic assistance in the provision of laparoscopic colorectal surgery in rural areas. Surg Endosc 2006;20:1389-93. Sebajang H, Trudeau P, Dougall A, Hegge S, McKinley C, Anvari M. Telementoring: An important enabling tool for the community surgeon. Surg Innov 2005;12:327-31. Lee BR, Png DJ, Liew L, Fabrizio M, Li MK, Jarrett JW, et al. Laparoscopic telesurgery between the United States and Singapore. Ann Acad Med Singapore 2000;29:665-8. Bogen EM, Augestad KM, Patel HR, Lindsetmo RO. Telementoring in education of laparoscopic surgeons: An emerging technology. World J Gastrointest Endosc 2014;6:148-55. Shin DH, Dalag L, Azhar RA, Santomauro M, Satkunasivam R, Metcalfe C, et al. A novel interface for the telementoring of robotic surgery. BJU Int 2015;116:302-8. Anvari M, McKinley C, Stein H. Establishment of the world's first telerobotic remote surgical service: For provision of advanced laparoscopic surgery in a rural community. Ann Surg 2005;241:460-4. Sharma Y, Bettadapura V, Plötz T, Hammerla N, Mellor S, McNaney R, et al. Video based assessment of OSATS using sequential motion textures. Georgia Institute of Technology USA; 2014. Fried GM. FLS assessment of competency using simulated laparoscopic tasks. J Gastrointest Surg 2008;12:210-2. Xeroulis G, Dubrowski A, Leslie K. Simulation in laparoscopic surgery: A concurrent validity study for FLS. Surg Endosc 2009;23:161-5. Okrainec A, Soper NJ, Swanstrom LL, Fried GM. Trends and results of the first 5 years of fundamentals of laparoscopic surgery (FLS) certification testing. Surg Endosc 2011;25:1192-8. Hazey JW, Marks JM, Mellinger JD, Trus TL, Chand B, Delaney CP, et al. Why fundamentals of endoscopic surgery (FES)? Surg Endosc 2014;28:701-3. Stegemann AP, Ahmed K, Syed JR, Rehman S, Ghani K, Autorino R, et al. Fundamental skills of robotic surgery: A multi-institutional randomized controlled trial for validation of a simulation-based curriculum. Urology 2013;81:767-74. Yule S, Flin R, Maran N, Rowley D, Youngson G, Paterson-Brown S. Surgeons' non-technical skills in the operating room: Reliability testing of the NOTSS behavior rating system. World J Surg 2008;32:548-56. Yule S, Flin R, Paterson-Brown S, Maran N. Non-technical skills for surgeons in the operating room: A review of the literature. Surgery 2006;139:140-9. Davidson PM. The surgeon for the future and implications for training. ANZ J Surg 2002;72:822-8. Guraya SY. Workplace-based assessment; applications and educational impact. Malaysian Journal of Medical Sciences 2015;22 (6):5-10. Guraya SS, Guraya SY, Habib FA, Khoshhal KI. Learning styles of medical students at Taibah University: Trends and implications. J Res Med Sci 2014;19:1155-62.